Through projects that span the globe and fuel the imagination, ISyE faculty and alumni are making a difference in the world. Georgia Peaches, Alaskan Salmon, and California Pears: Where does your food come from? Faculty members in ISyE are working to identify and develop solutions across the wide-ranging, critically important field of food traceability. Jeff Wu discusses big data and the potential in exploring the vast store of information accumulated by millions of business and consumer transactions in modern life. Ton Dieker, assistant professor in ISyE, has been awarded the prestigious National Science Foundation CAREER Award. C.F. Jeff Wu, the Coca-Cola Chair in Engineering Statistics and professor in ISyE, received the 2012 US Army Wilks Award during the 2012 Army Conference on Applied Statistics on October 24. ISyE Assistant Professor Sebastian Pokutta recently co-authored a paper that breaks down a woman's "perfect day" in minutes based on concepts of optimization to maximize happiness. 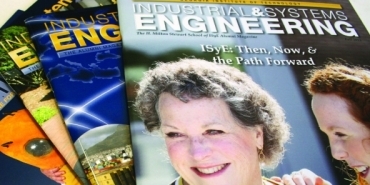 Members of the ISyE advisory board offered their perspectives on industrial engineering in the 2012 ISyE Alumni Magazine. Faculty and students in ISyE were among those selected as winners and fnialists for the various prizes and awards given at the 2012 INFORMS Annual Meeting, held October 14-17 in Phoenix, AZ. Ton Dieker, assistant professor in ISyE, won the prestigious Erlang Prize at the 2012 INFORMS Annual Conference in Phoenix, AZ on October 15. Andrea L. Laliberte, MS IE 1984, has established the Andrea L. Laliberte Endowment Fund through a $3 million bequest provision, providing unrestricted support for ISyE. Jerry Banks, Professor Emeritus in ISyE, passed away on September 25, 2012, surrounded by his family. A joint Georgia Tech-Council on Competitiveness Report has been published on the "U.S. Manufacturing Competitiveness Initiative: Dialog on Next Generation Supply Networks and Logistics." The most recent class of supply chain engineering master's students at Georgia Tech has successfully completed a set of capstone projects. Bill Cook, Chandler Family Chair Professor in ISyE, has been elected the new Chair of the Mathematical Optimization Society. Professor David Goldsman was named a Fellow of the Institute of Industrial Engineers (IIE) during the 2012 IIE Honors & Awards Banquet on May 21. Lee Burrell reflects on his experience in the Supply Chain Engineering Master's program in ISyE, as he prepares for graduation and a future career in supply chain engineering. Members from the ISyE Advisory Board gave career advice to students during the “Careers in Industry” panel on April 20, 2012. Five distinguished alumni have joined the ISyE Advisory Board for the 2012 to 2016 term. Errika Mallett, IE 1996, an HR manager for Southwire, shares her unique career experience and valuable career advice. Roshan Joseph Vengazhiyil, associate professor in ISyE, has been elected a Fellow of the American Statistical Association. ISyE held its annual Undergraduate Student Awards Ceremony on April 17, 2012 to recognize some of ISyE’s exceptional undergraduate students. 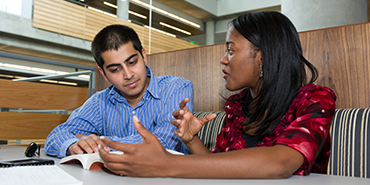 The Georgia Institute of Technology and Emory University are partnering to offer a new master’s degree program track in predictive health. Jelece Morris, a graduate student in ISyE, has been named the National Society of Black Engineers Mike Shinn Distinguished Member of the Year (Female) for 2012. The EMIL-SCS class of 2012 recently completed their fourth residence, with visits to India, Thailand, Hong Kong, and China. 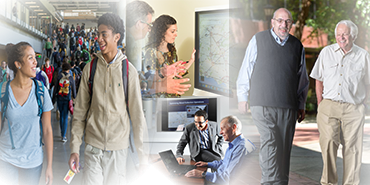 Georgia Institute of Technology graduate programs continue to earn high marks from U.S. News & World Report's annual rankings. Marakada “Mike” Chitharanjan Shetty, retired professor in ISyE, passed away on February 25, 2012 in Great Falls, Virginia. The EMIL-SCS program has launched a new Facebook page. Kristin Goin, MS HS 2008, has been selected to be the Institute of Industrial Engineers (IIE) representative for the 2012 New Faces of Engineering. John Kang, IE 2011, and his father Chang W. Kang, PhD recently shared a unique Senior Design experience. Ming Yuan, associate professor in the H. Milton Stewart School of Industrial and Systems Engineering (ISyE), has been awarded the Coca-Cola Junior Professorship for a three-year term. 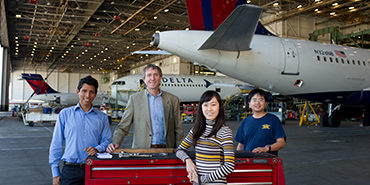 ISyE leads the way in advanced manufacturing research and development at Georgia Tech, specializing in many related disciplines. R. Gary Parker discusses operations research in ISyE.